I had a visitor late last week, and I thought I would show him around town. The fact that my visitor was a pirate, and under 6 inches tall, did not hinder us in the least. 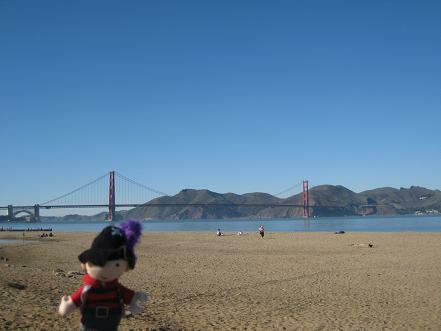 After the pirate passed my dog’s smell test, we headed into San Francisco for some sightseeing. First we stopped by a pirate supply store in case my little friend needed any equipment. He wasn’t very impressed, so instead of buying supplies, we sat in the park for a while. 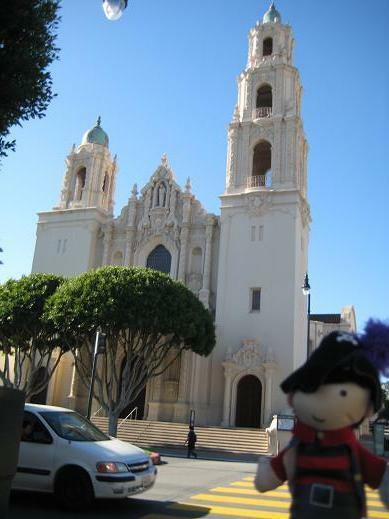 Then we stopped by Mission Dolores. 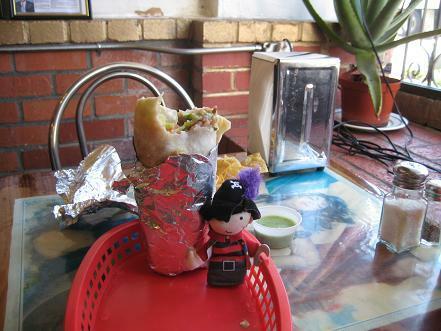 My pirate friend was hungry for lunch, so we went to the oldest Taqueria in San Francisco and ate a burrito that was bigger than the pirate. A lot bigger. 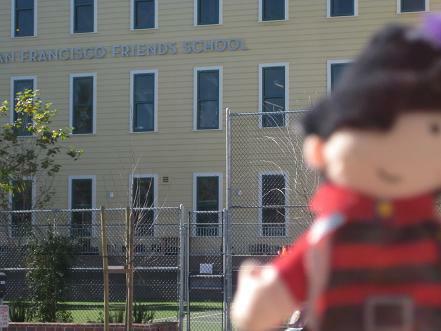 After we left the Taqueria, we happened to pass by the San Francisco Friends School. We biked through Chinatown and ended up at the beach, where we had a great view of the Golden Gate Bridge. It was a long day, but we had fun. 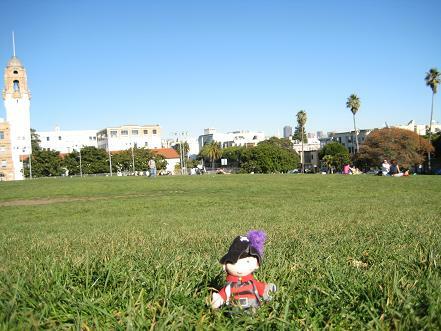 I would have shown the pirate around Berkeley and Oakland too, but he was eager to continue his journey, so I came home and he departed for further adventures elsewhere. This entry was posted on Sunday, January 18th, 2009 at 11:26 pm	and is filed under Pirates. You can follow any responses to this entry through the RSS 2.0 feed. You can skip to the end and leave a response. Pinging is currently not allowed. Where has the pirate gone now? Is the pirate any kin to the “flat [kid’s name] ” adventures so popular in the primary grades these days? Or to the gnomes? Or to the police van in season 2 of The Wire? You did a lot of cool sightseeing. I’m surprised you could find so much in one town! At first I thought it was a real pirate, but then I figured it out. You rode your bicycle? That far? ng: We’ll have to await further dispatches from the pirate. I’m sure he’ll keep in touch some way or some how. Carol: A little more than kin and less than kind. Stanley is the flat kid’s name. He doesn’t hold a candle to a pirate, imho. I don’t remember the police van in season 2 of the Wire. I don’t remember much about that season except the bar the longshoremen hung out in before, during, and after work. gabriel: I only touched on San Francisco’s numerous sights. 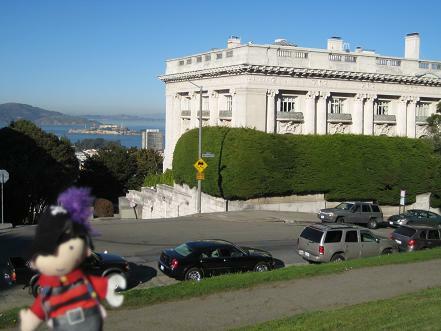 If the pirate ever visits again, I’ll take him to Golden Gate Park and the Musee Mechanique and maybe a Giants game, for starters. And yes, I rode my bicycle that far. It was only about 12 miles, but the hills were steep and there were a lot of them! I just noticed that I capitalized “Taqueria,” twice. That’s not its name — must have been the German part of my DNA controlling my fingers as I typed. Flat Stanley is the character in the book and the (new?) movie, but he has inspired a whole generation of primary school teachers. In the last three years I’ve been visited by “flat Riley,” “flat Regan,” “flat Jayme,” each looking for some item about SF to share with their class. I was buying city maps with an ancient picture of my house (before the damned city tree in front got so big), but that gets expensive, so Ive reverted to Palace of Fine Arts postcards. The police van is taken by the longshoremen very early in their struggle about the stained glass window, and they ship it all around the country. The police captain gets pictures of it in the mail from various ports of call; it keeps his anger at the union secretary at the boil. Did your pirate know Jack London? That little pirate would LOVE the Musee Mechanique! Great after reading the Pirates adventures for some reason I’ve got that song Brandy by Looking Glass from the early 70’s stuck in my head now.But that may be a good thing because this morning my Trader Joes was playing Tammy when I walked in the door. jabel: I suggest putting on some Beatles at times like those. Better to have them stuck in your head — and they will get stuck — than nearly anything else. ng: well, maybe he’ll come back someday for round two. Carol: I thought about visiting Jack’s cabin in his eponymous square, then taking the ferry to SF, but BART is cheaper and faster, so the pirate missed both Jack London and the nice views from the water. I’ll add it to the list for next time. Now that you’ve reminded me about the police van, I have some vague recollection of David Simon saying that it had really happened to some hapless police captain. Could just be my memory playing tricks on me again, though. Thank U for introducing us to your little friend. is there any way i can post flat Howdy pics to your website? we have a bunch. he had some great adventures in oregon and seattle, and is off to the warmer climes of hawaii…. 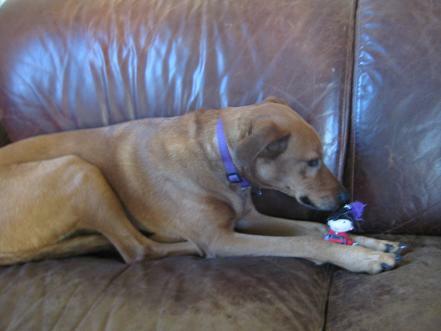 Your little pirate bears some resemblance to snoopy.